Fortrans, Inc. is proud to introduce our new 6000 series of high-capacity pH control systems. 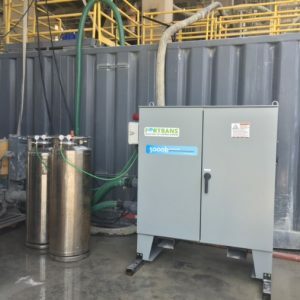 This automatic pH control equipment uses carbon dioxide (CO2) gas to neutralize large volumes or flows of water in basins, tanks, stormwater resevoirs, boiler blow-down water sumps, or for water carried in pipelines. All 6000 series systems use our signature patented Dif-Jet™ CO2 gas injectors for the most efficient mixing of carbon dioxide gas into water—even water with high volumes of dissolved solids. The Dif-Jet injector will not foul or leak over time, and they come backed by a full 10-year warranty. Fortrans’s new 6000 series of pH control systems feed volumes ranging from 60 pounds to 120 pounds of CO2 per hour, and these feed volumes can be adjusted in increments of 20 pounds per hour. 6000 series systems are housed in gray-painted or 304 stainless NEMA 4X panels. All electronics, such as PLCs, CO2 flow meters, flow controls, monitors, and sensors are enclosed securely in these durable, high-quality panels. Our 6000 series pH control systems are equipped with pumps that circulate the water—no carrier water required— through our unique gas-transfer-pipe mounted injectors located in panels. Dual-pressure technology ensure high efficiency and reduced gas flash-off. The unique designs of our pH control systems and our Dif-Jet injectors make them the most efficient option for large-scale pH control, using cost-effective carbon dioxide rather than expensive, harmful chemicals. Plus, because our Dif-Jets never allow scale buildup, you won’t have to incur costly downtime for regular cleaning and maintenance. Contact the industrial process water treatment and pH control professionals at 866-958-7267. We can partner with facility in the United States and Canada.